In the years since the first edition of The Geology of Northern Ireland was published in 1972 many new theories have become generally accepted in geology, and perhaps the most significant of these is the understanding of plate tectonics. This, in conjunction with an increasing knowledge of other geological processes, has required a re-examination of the geological history of Northern Ireland. The first edition was the earliest publication to describe the detailed geology and landscape of Northern Ireland for both geologists and non-geologists. That it is only now necessary to update it is a tribute to the author, the then Director of the Geological Survey of Northern Ireland, Harry Wilson. 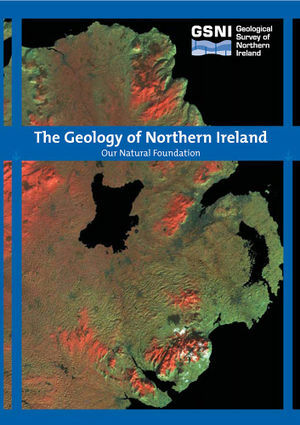 The Geology of Northern Ireland-Our Natural Foundation gives a comprehensive account of the rocks and deposits shown on the 1997 edition of the 1:250 000 scale geological map of Northern Ireland and is written primarily for geologists and geoscientists. However, it is also intended to be of value to planners, civil engineers and environmental scientists who require an overview of the geology of Northern Ireland. In addition, we hope that it will attract the interest of walkers, naturalists, cavers, climbers and other outdoor-based pursuits that spend time on the bedrock and superficial deposits that are our natural foundation. In addition to providing a comprehensive account of the geology of the region, The Geology of Northern Ireland complements other GSNI publications, including ‘A Story through Time’ and the ‘Explore’ and ‘Walk’ guides from the Landscapes from Stone project. The publication also includes new and unpublished information contained in the archive of the GSNI. Northern Ireland represents a small area of the Earth’s surface but yet contains a wide array of rock types, of many different geological ages, which are reflected in the variety of landscapes present. These extend from the high moorland of the Antrim Plateau with the magnificent Glens of Antrim along the north and eastern coastal fringes, to the rolling fields of Counties Down and Armagh, which are pierced by the Mountains of Mourne and Slieve Gullion in the south and east. In the northwest, the rounded and glaciated peaks of the Sperrin Mountains give way to the maze of waterways of the Fermanagh Lakeland in the southwest. All of these landscapes reflect the interaction between the underlying rocks and geological processes that give rise to the varied environmental niches that support our widely varied natural flora and fauna. The Geology of Northern Ireland endeavors to present detailed geological information in a systematic and user-friendly way. Each chapter, commencing with the oldest rocks and progressing through time to the final glacial episode, allows the reader to understand the setting of each geological period on national, regional, local and individual locality scale. It is hoped that the provision of general information, supported by detailed maps,will facilitate visits to areas too long regarded as being ‘off-the-beaten-track’ and will act as a guide to localities of outstanding geological significance. Therefore, in almost every chapter, sites of national or international significance are described and augmented by photographs, largescale maps and grid references. The book also provides an up-to-date account of the results of mineral and hydrocarbon exploration and reflects on the prospects of new discoveries being made in Northern Ireland. In compiling The Geology of Northern Ireland, the GSNI have drawn heavily on the expertise and experience of staff of the British Geological Survey and of academic staff at universities in Ireland and Britain. Their efforts are gratefully acknowledged. Detailed knowledge of the geology of an area can help reduce risk in all scales of development. The GSNI hope that The Geology of Northern Ireland-Our Natural Foundation will highlight the value of geological information. A geologist is never more than a phone call away! The following geologists provided excellent advice and encouragement whilst reviewing chapters of the new book: Dr Bernard Anderson (formerly Queen’s University Belfast (QUB), Chapters 1, 3, 8, 17). Mr John Mendum (British Geological Survey (BGS), Chapter 2), Dr Jim Floyd (BGS, Chapter 4). Dr Ian Meighan (QUB), Chapters 5, 15), Dr Mike Stephenson (BGS, Chapter 6). Dr Ian Somerville (University College Dublin, Chapter 7). Dr Geoff Warrington (formerly BGS, Chapters 9, 10, 11), Dr Jim Riding (BGS, Chapters 12, 13, 16). Dr Paul Lyle (University Ulster Jordanstown, Chapter 14). Prof Marshall McCabe (University Ulster Coleraine (UCC), Chapter 18). Mr Sam Holloway (BGS, Chapter 19), Mr Nick Robins (BGS, Chapter 20) and Dr Alastair Ruffell (QUB, Chapter 22). Dr Ian Meighan kindly provided information on geoarchaeology for Chapter 18 (Quaternary). The final review of all the chapters by Prof Tony Bazley has greatly improved the book. In addition the GSNI has received assistance and advice from staff in the GSNI and BGS and from associates in museums, universities and institutes throughout Ireland and Britain. I hope that the following list is exhaustive. Mr Tim Cullen (BGS, Photography). Mr Brian Routledge (Ulster Museum, Belfast (UM), Photography). Mr Hugh Crilly (GSNI, Cartography), Mr Andy Hulbert (BGS, Cartography). Ms Janis Smyth (formerly BGS, Cartography), Dr Alan Brandon (formerly BGS, Chapter 7). Mr Alex Donald (GSNI, IT support), Ms Dee Flight (BGS, Chapter 21). Dr Jasper Knight (Edge Hill College, Chapter 18). Dr Steve McCarron (Trinity College Dublin, Chapter 18). Dr Patrick McKeever (GSNI, Photographs), Dr John Morris (Geological Survey of Ireland-GSI). Mr Derek Reay (GSNI), Dr Ian Somerville (Photographs), Mr Geoff Warke (BGS, Photographs). Mr Mark Williams (BGS, Chapter 3), Dr Neil Clark (Hunterian Museum, Glasgow). Dr Mike Howe (BGS), Mr Ken James (UM), Dr Matthew Parkes (GSI), Dr Mike Simms (UM). Mrs Pauline Taylor (BGS), Dr Mark Woods (BGS). This page was last modified on 29 September 2017, at 20:33.